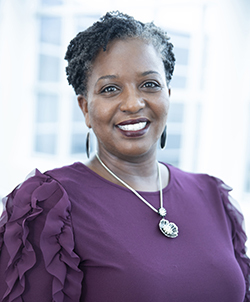 Dr. J. Richelle Joe is a graduate of the College of William & Mary in Williamsburg, VA where she earned her doctoral degree in Counselor Education and Supervision. She has served as a professional school counselor in Virginia and is a Nationally Certified Counselor and an Approved Clinical Supervisor. Her research focuses on culturally responsive services for underserved and marginalized clients and communities, and specifically includes an emphasis on effective school-family relationships, the experiences of individuals of color, and the mental health needs of individuals and families affected by HIV/AIDS. At UCF she leads H.E.A.R.T., the HIV Education, Awareness, and Research Team and is involved with student organizations, such as the Holmes Scholars Program. Additionally, Dr. Joe is active in multiple professional organizations, including the American Counseling Association, the Association for Counselor Education and Supervision, the Association for Multicultural Counseling and Development, the National Board for Certified Counselors, and the Association for Moral Education. Joe, J. R. (In Press) Counseling to end an epidemic: Revisiting the ethics of HIV/AIDS. Journal of Counseling and Development. Shillingford, M.A., Joe, J. R., Co-investigator, & Oh, S. (2016-2017). Exploring the physical and mental health of African American mothers raising boys and young men. University of Central Florida, Toni Jennings Exceptional Education Institute, $7200 (funded).